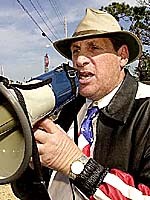 THE chairman of the Jewish Defense League and a follower were arrested after allegedly plotting to blow up a Culver City mosque and the office of Rep. Darrell Issa, R-Calif., federal authorities said today. Irv Rubin, 56, and a member of the militant group, Earl Krugel, 59, both of Los Angeles, were arrested late Tuesday after the last component of the bomb-- explosive powder-- was delivered to Krugel's home, U.S. Attorney John S. Gordon said. Other bomb components and weapons were seized during a raid at Krugel's home. Rubin and Krugel were expected to appear in court later today. They were booked for conspiracy to destroy a building by means of an explosive, which carries a maximum five year sentence, and possession of a destructive device related to a crime of violence, which carries a 30-year mandatory sentence. A government source told authorities about a series of meetings at which the scheme to bomb the King Fahd Mosque in Culver City and Issa's office was hammered out, Gordon said. The original target was to be the Muslim Public Affairs Council in Los Angeles but the source told authorities there was another meeting last weekend and it was changed. "Prior to last night's arrest, the source delivered explosive powder, the last component required to begin construction of the bomb, to Krugel's residence," the U.S. attorney said. The complaint against the pair quotes Krugel as making a comment during a meeting that Arabs "need a wakeup call." Tajuddin Shuaib, director of the King Fahd Mosque, said he was astonished by the alleged plot, which came during Ramadan, the holiest time of the year for Muslims. He said no threats were received by the mosque. As many as 1,000 people attend the mosque to pray there during the Ramadan season. "I can't understand why people would do such a thing. We are not against Jews. We are not against anybody. We are like any church or synagogue or temple," Shuaib said. Issa, the grandson of Lebanese immigrants, is on the House Committee on International Relations and supports Israeli-Palestinian peace negotiations. Last month, he met with Lebanon's president to discuss Hezbollah, which the United States considers a terrorist group. Issa, who represents northern San Diego County, called on the group to renounce terrorism. Calls to Issa at his San Clemente office were referred to Washington. A spokesman didn't immediate return calls. Law enforcement agencies raided Krugel's Reseda late Tuesday. Several hours later, the screen door of the red brick home was broken and part of the fence had been knocked down. A menorah, the Jewish candelabra used for Hanukkah, was visible through a window and there was an American flag on the mailbox. "Irv Rubin never had anything to do with explosives," said Rubin's attorney, Peter Morris. "It seems to us that, given the timing ... the government's action is part of an overreaction to the Sept. 11 events." Matthew McLaughlin, an FBI spokesman in Los Angeles, "The tools might have been in place to do this thing," he said. "We don't put people in (custody) just for superficial impressions. We put people in place for their physical actions." Rubin's wife, Shelley, said by telephone her husband and Krugel were innocent. "They are law-abiding, good people," she said. Maher Hathout, a senior adviser for the Los Angeles chapter of the MPAC, said he learned today they had been a tentative target. He said the arrests sent an encouraging message to the Muslim community. "We can easily develop an attitude that (federal authorities) are out to get us," he said. "But it seems they are out to get anyone who breaks the law." The JDL opposes what it considers threats to the Jewish people, whether from Arabs, evangelizing Christians or pro-peace Jews. Originally formed by Meir Kahane to mount armed response to anti-Semitic acts in New York City, it gained notoriety when its members were linked to bombings, most of them aimed at Soviet targets in retaliation for the way that country treated its Jewish population. When Kahane left the JDL, there was a power struggle as Rubin vied for control. Kahane was assassinated in New York in 1990. El Sayyid Nosair, 36, an Egyptian-born Muslim, was convicted in connection with the shooting. Rubin has made a career out of confrontation, challenging white supremacists to fistfights, burning a Confederate flag outside a Reno courthouse, and being tried in 1980 for soliciting the murders of Nazis in the United States (he was found innocent). By his own count he has been arrested more than 40 times.